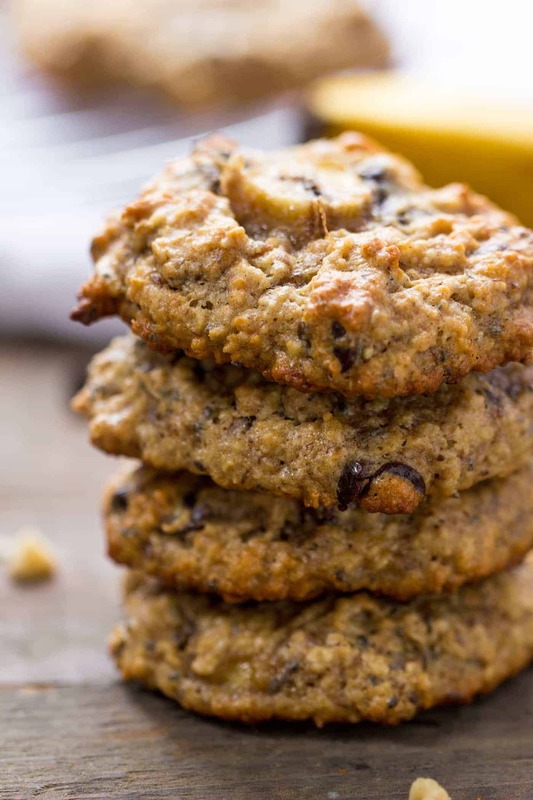 These quinoa breakfast cookies taste like dessert, but are healthy enough for breakfast! 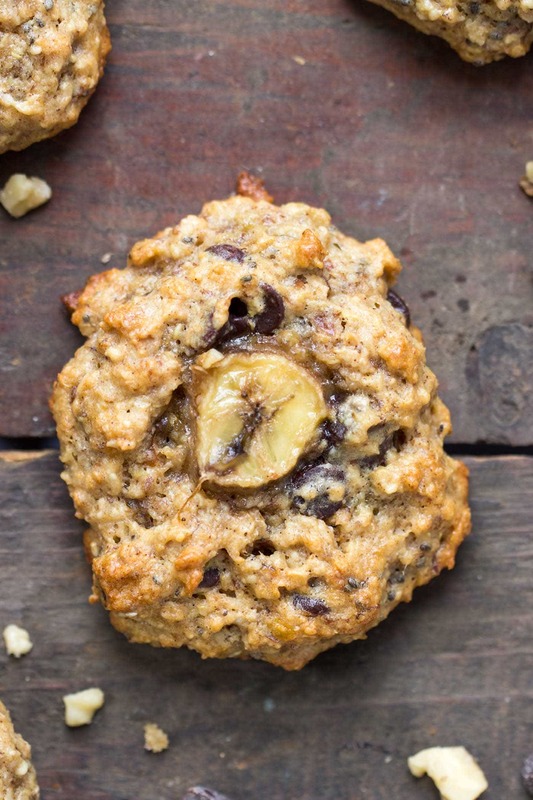 Flavored with banana, peanut butter, oats, quinoa & chocolate! Posting a cookie recipe on the day that you're starting a 3-day juice cleanse probably isn't the best idea. Here I am, sipping on green juice, practically drooling on my keyboard. I want to devour my screen! 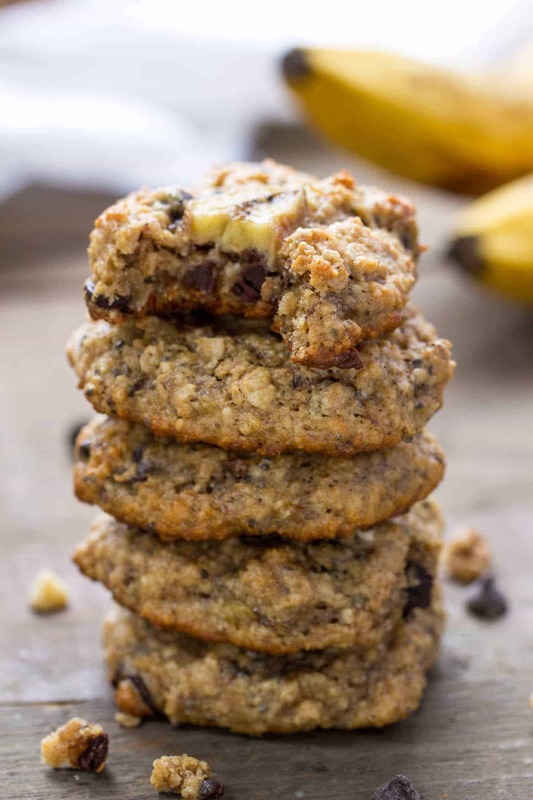 Seriously, all I want to be eating are these Chunky Monkey Quinoa Breakfast Cookies, and instead I'm drinking vegetables and won't be having another bite of solid food for three days…wah! BUT I couldn't resist sharing these. I made them on Friday and they were gone by Saturday, so that was a sign that you needed them as soon as possible. 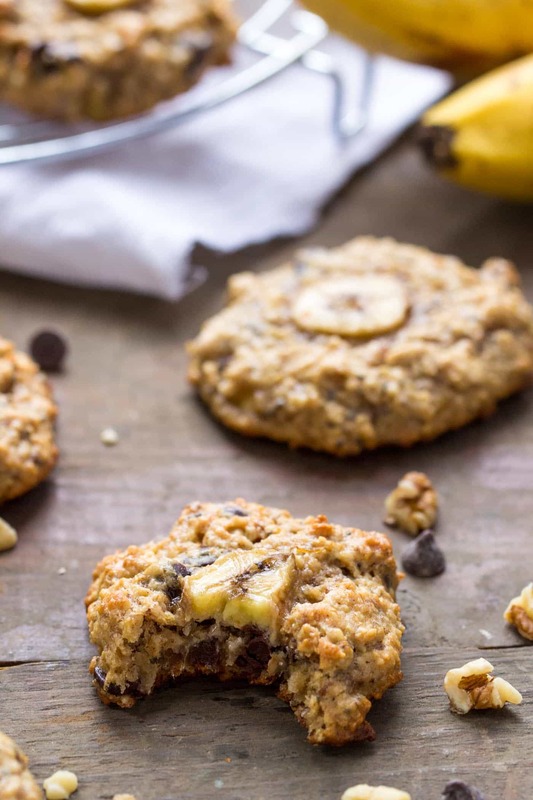 We're big fans of breakfast cookies around here, aren't we? There's been a total of four different flavors so far – Toasted Coconut Quinoa Breakfast Cookies, Zucchini Bread Quinoa Breakfast Cookies (one of my faves!! ), Carrot Cake Quinoa Breakfast Cookies and Pumpkin Pie Quinoa Breakfast Cookies – and honestly, I think these new ones might be my favorite. The goodies inside this version are just too hard to resist. First there's chocolate. We haven't had chocolate in our cookies yet, and let's be honest…chocolate just makes everything better. Second, there's peanut butter + banana, which if you know me, is pretty much my absolute favorite combo. Third, there's chopped dates which again…obsessed. And fourth, well….they're cookies. for breakfast. I just can't even. Yes, my friend they are. They're gluten-free, vegan (which means no dairy, eggs or honey), oil-free and naturally sweetened. The base is banana, flaxseed meal, peanut butter and a little bit of maple syrup. Then we mix in oats, quinoa flakes, chia seeds, some spices and then our add ins. 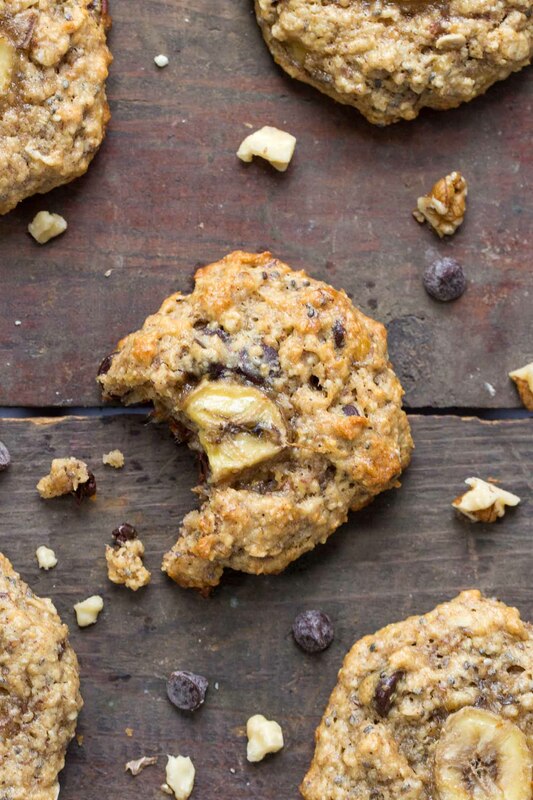 So basically…it's like we're eating a bowl of oatmeal but in cookie form. 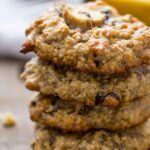 I love the combo of oats and quinoa flakes because unlike using just oats, the quinoa flakes add more protein which makes each cookie just a teeny bit more filling. What other flavors would you like to see? I'm tossing around a chocolate brownie one and maybe one with freeze-dried berries (like strawberry cheesecake maybe?! ), but is there any that come to mind for you? Let me know in the comments! Omg 😲 these are amazing !!!! I’ve just found you due to finding a box of quinoa flakes in the back of my cupboard which I needed a recipe for !! I used raisins instead of dates and cacao nibs instead of chocolate drops and the result was amazing 😉 looking forward to trying many of your guilt free treats ….yes I was once a sugar addict but learning now how to satisfy my sweet tooth within having sugar laden rubbish !! Hi again ….could you tell me if your cookies are suitable for freezing ?? Really fancy batch baking and freezing them . Hi, I recently tried out your toasted coconut breakfast cookies and am planning to try these but just have a couple of questions! Did you use natural peanut butter or just the regular stuff? Also, you specify medjool dates but I happen to have deglet Noor in my cupboard…is there a reason why you specify medjool? thanks! I found the texture of these to be strange… kind of cake-like, instead of cookie-like. How do I make them more crunchy? They tasted good but the texture thing threw me off. I’d say cook them for longer next time 🙂 Or let them dry out in the oven a bit! Hi, can I leave out the maple syrup? Is that for sweetness or for binding? I’m trying to keep themse as low sugar as possible. Thanks! It’s for sweetness mostly 🙂 I haven’t tested without maple syrup though, so I can’t say for sure that they’ll turn out as pictured! I am allergic to bananas. What amount of applesauce can be substituted for the banana? 1 cup of what may I ask? These “cookies” are so awesome, they have so much flavor and my kids just love them. This time I left out the dates because my kids didn’t care for them last time (I want to try making a paste and using that next time) and they were still plenty sweet for our tastes! I love that these have quinoa, oats, peanut butter, and a flax egg, that’s all stuff I feel no guilt whatsoever about feeding my kids! These look awesome, thanks for the share, going to bake these for my two little boys! I think they’re going to LOVE them! Just wanted to let you know that when I read ‘quinoa flakes’ I assumed it was some kind of breakfast cereal, so I subbed in cornflakes and they turned out well! Nice crunch. Not quite as healthy but an interesting variation. I can honestly say this is truly the best healthy cookie on earth. I substituted oats for the quinoa flakes and didn’t add the dates and vanilla (because I didn’t have either). These look so good! I am trying to avoid eggs though and don’t have flax seed. Would chia seed with water instead of flax seed with water work? Thanks. I’m planning to make these soon substituting Oats for the quinoa flakes. I made a “flax egg” for the first time to make these cookies. Once you try it, you will see that it instantly turns into an “yolk like” consistency. I do not think chia seeds would work at all in the same way. Maybe ground chia? Also I just used uncooked quinoa (organic) and they turned out fine! Maybe cooking the quinoa first would be better but, overall, these turned out pretty good! I’m strictly nursing my first baby (almost 5 months) and I’ve acquired a real “sweet tooth”. These CMC’s are pretty darn good to curb that sweet craving!!! I’ll let you know what my best critic (I.e., husband) has to say about these ones! Can I use quinoa flour (I don’t have flakes) instead of the flakes? THank you! I haven’t tried with flour vs. flakes, but if you do, I’d say you would want to reduce the amount. Start with 1/4 cup of flour and add more until you get the right texture! Did you come up with a quinoa grain version instead of flakes? My concern is flakes cost 4x the grain. Which is not good if you want to eat these EVERYDAY. These look amazing. My little boys are allergic to oats, what would you recommend I sub in for them? If I were trying to calculate the nutritional values, do you have an easier way than taking the sum of the ingredients and then dividing it by serving size? 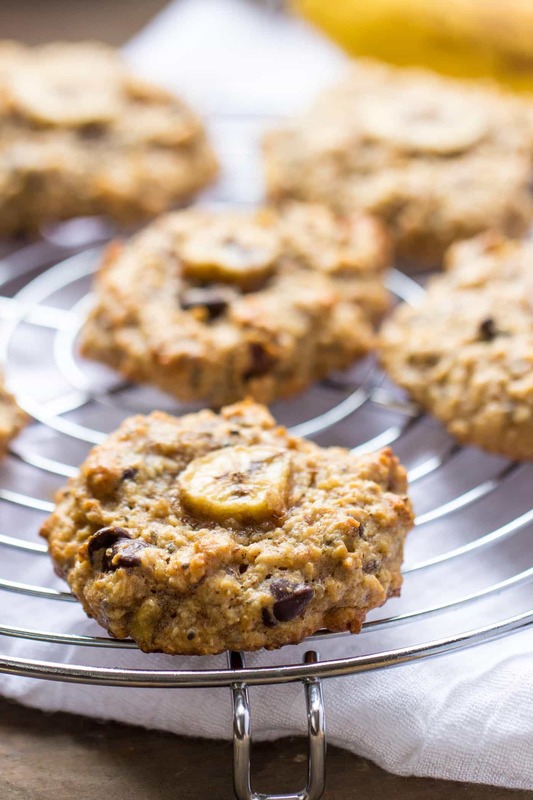 My grandma is on a fairly strict low sodium diet but she might enjoy these… I’m definitely making them for myself but would need to figure out the total sodium per cookie before she could give them a try. Hi there! New to your blog and already a huge fan! Love anything to do with quinoa. I came in search of quinoa breakfast cookies and breakfast bowls since I typically use quinoa in savory dishes and want to try something new! Question, are the quinoa flakes a must or is it possible to use regular quinoa? I’m sure the texture would be different but curious if you’d ever tried it? Thanks so much! Hi there! First, welcome!! So happy to have you here 🙂 I actually haven’t tested these with regular quinoa, but what I think you might be able to do is replace the quinoa flakes with rolled oats and add in about 1/4 cup of cooked quinoa. Again, can’t guarantee results, but that’s where I would start 🙂 I’ve had a lot of requests for that, so I think I need to come up with an option that doesn’t use flakes! This recipe looks delicious. I just found your site today. I hate to tell you but OATS are not gluten free. There is a major toss up on these and anyone with gluten sensitivity or celiacs should not be eating OATS. Thank you for this recipe. Knowing I’d like it, I doubled the batch. Only change was to use blueberries in place of the choc. chips. This will be easy breakfasts at home or during travels. And, yes, they are so good. Hello! I have a quick question, I don’t have quinoa flakes, but I do have quinoa seeds. I am a total lover of healthy breads and cookies, and I have been craving to make some of your recipes, but I see that they usually call for flakes and not seeds! Is there a way that I can substitute the seeds for the flakes? I haven’t tried making it with cooked quinoa, but if you have quick cooking oats, you could just swap those in for the flakes. My mom actually made these the other day and said she used almond flour and it worked well, so you could try that too 🙂 xo! They’re raw when you add them in 🙂 Glad they worked for you! Any ideas on what to substitute for the oats… I am grain free. How about more quinoa flakes?! toasted peacan, coconut, strawberry, chocolate chip? LOVE those ideas! I have a blueberry muffin one coming tomorrow and have a toasted coconut one already too. The strawberry and also chocolate chip sounds amazing. Thanks, Carly! Hi Alyssa, these cookies look delish! however, i don;t know if we have quinoa flakes here (Vancouver Canada), can it be substitutes with another form of quinoa or can they only be made with the flakes? Hi. I live in Toronto and found the Quinoa flakes at Bulk Barn…. Pretty sure those stores are across the country. Or try a health food store (whole foods for example) and they’re sure to have it. Haven’t tried the cookies yet… But got all the ingredients yesterday and planning on making them today. They look very promising! This looks delicious! I am a very recent quinoa convert. Now, I have no idea what I was waiting for! I make meals for my two young boys, my hubbie and myself, plus my stepfather a few days a week. My older son is 12 and is a Type 1 diabetic (used to be called “Juvenile Diabetes”-it is an auto-immune disease). We try very hard to eat healthy and balanced, but are just at the early phases of this journey. Do you happen to have the nutritional data for your recipes? Specifically, serving sizes and carbohydrate information? Thank you! You have some really great looking meals I have tried Quinoa and I like it a lot I’m just trying to find more dishes that will help with weight loss and detox I find some of these to be. Hope you give the cookies a try – they’re a fave around here! I can relate. I’m on a five-day fast and I know it’s not a good idea to browse food blogs this week, but here I am, drooling over breakfast cookies. Hello chocolate. I want to curl up in a corner and eat a plateful of those cookies by myself. SOO glad that you enjoyed them! I hear ya there 😉 Glad to be done with mine and ready to make a batch of these beauties this weekend!